Decent value and reliable. Easy to use too. Slightly on the noisy side - a minor criticism, but if this is likely to annoy you then you might want to look elsewhere. The Panasonic NN-E281MMBPQ offers a fairly decent specification for a price tag of around £60. For a solo microwave oven, it is priced in the mid range price bracket - not too cheap and cheerful, but not high end at the same time. Overall it has a nice traditional design - it is attractive to look at, and won't look out of place in the average modern kitchen. It's 20 litre capacity is surprising given the small overall dimensions of this appliance - measuring approximately 43cm by 33cm by 26cm - it easily accommodates dinner plates, as well as the vast majority of pyrex containers. It does make a reasonably loud noise as the turntable rotates - but this isn't something that would put us off purchasing this model. It offers 800w of power - so slightly less than the 1000w silver microwaves on the market - however this will be fine for the majority of users. The controls are well labelled and easy to use, and the Panasonic display is perfectly readable. The built in "auto weight" settings help to automatically work out the cooking time for items - a handy addition for those less experienced in using microwaves. Cleaning is pretty easy; the acrylic interior is wipe clean, helping to maintain the appliance's new looks. So who is it aimed at? Costing around £25 more than the cheapest of microwaves, it offers a bit more reliability than a budget microwave - spending a little extra is well worth the extra peace of mind. 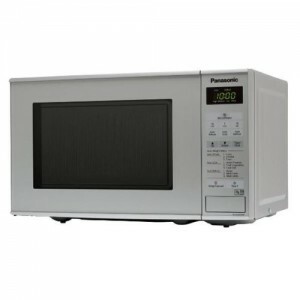 If you're looking for a reliable yet simple to use solo microwave oven, and one that will withstand years of use, then the Panasonic NN-E281MMBPQ is well worth considering, especially if you're on a budget.